Closet is an installation of 25 delicate cutouts of Mary Hogarth’s dresses located in a secret room at the Dickens Museum. Mary Hogarth was the sister of Catherine Dickens, Charles’ wife. She stayed regularly at 48 Doughty Street where she occupied a room next to her sister and brother-in-law. It is recorded extensively that Charles was extremely fond of Mary, spending a lot of time with her and showering her with gifts. Some speculate that he was simply impressed by her gentle and selfless nature whereas others think of it more as an unhealthy obsession with an underage girl. On 7 May 1837 Mary died suddenly at the age of seventeen. Charles was overcome with grief – not only did he keep a lock of her hair and a ring she wore, he also kept all of her clothes in a secret place, which he looked at from time to time over the next 2 years. Furthermore he had regular night visions of Mary and often expressed his desire to be buried with her. 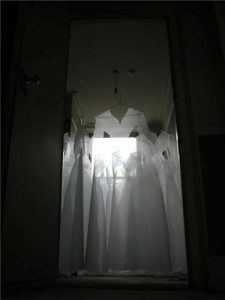 Closet represents the clothes that Mary wore and her continuing presence in Charles’ life, not only in his mind, but also as a ghost in the house.